Amid all the rightful outrage over Gov. 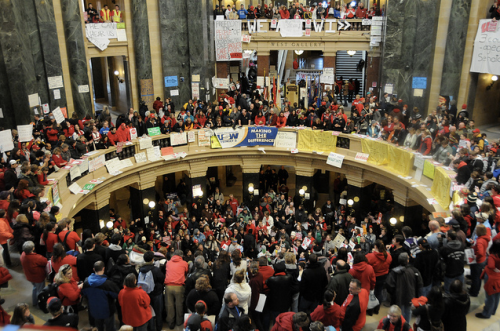 Scott Walker's proposal to do away with collective bargaining rights for public sector unions in Wisconsin, one important point has been neglected: The demise of public sector unions would be most detrimental to women and African-Americans, who make up a disproportionate share of the public sector workforce. Much has been made of Walker's decision to exempt from his plan firefighter, police and state trooper unions -- conveniently, the only three public sector unions that endorsed him. But as Dana Goldstein points out, not only are the exempted unions largely Republican-leaning, they’re also overwhelmingly male -- over 70 percent of law enforcement personnel are male, as are over 96 percent of firefighters. On the other hand, many of the non-exempt unions represent professions that are disproportionately female -- approximately 80 percent of teachers are women, for example, as are 95 percent of nurses. African-Americans are also disproportionately employed in the public sector: According to a report by the nonprofit United for a Fair Economy, blacks are 30 percent more likely than the overall workforce to hold public sector jobs. Kai Wright reports that preliminary data from a study by Steven Pitts of U.C. Berkeley's Center for Labor Education and Research shows that 14.5 percent of all public sector workers in the nation are black, compared to 10 percent in most other sectors, and around a quarter of black workers are employed in public administration, as compared to under 17 percent of all white workers. A Republican proposal that hurts women and people of color? I'm shocked, shocked! All jokes aside, I'm not arguing that Walker intentionally targeted women-heavy professions for union busting, or that he's secretly trying to undermine one of the remaining sources of stable employment for blacks, who are unemployed at nearly twice the rate of whites. But it doesn't need to be intentional to have serious effects. Some of those effects are economically tangible. Despite high rates of public sector employment, black women working in the public sector make less than others, with a median wage of $15.50 an hour compared to the sector's overall median of $18.38 and a median of $21.24 for white men. Yet weakened public unions will make it more difficult for black women to bargain for better wages. Furthermore, as the Shriver Report finds, "nearly 4 in 10 mothers (39.3 percent) are primary breadwinners, bringing home the majority of the family's earnings, and nearly two-thirds (62.8 percent) are breadwinners or co-breadwinners, bringing home at least a quarter of the family's earnings." Making women's jobs more precarious has serious implications for the well-being of millions of families -- especially for families in the bottom two income quintiles and black and Hispanic families, where female breadwinners are particularly prevalent. Others are subtler: As Wright points out, the portrayal of public sector employees as overpaid and underworked, taking advantage of hardworking taxpayers, carries echoes of racially charged caricatures -- the welfare queens of the '80s behind a desk in the Capitol. And politically motivated though it may be, the continued elevation of traditionally male professions like public safety and law enforcement over traditionally female ones like public health and public education is part of the reason women still earn only 77 cents for every dollar men do. The events in Wisconsin are just one example of a larger trend of Republican efforts to make it more difficult for women, and particularly low-income women, to go to work (for example, by proposing significant cuts to childcare benefits and preschool programs) while simultaneously slashing services that women need to care for themselves and their families (for example, proposing to cut nearly a billion dollars from programs aimed at promoting the health of low-income pregnant women and mothers). And if that weren't enough, when public budgets are cut, women often make up for the cuts by volunteering at schools and providing unpaid childcare. Likewise, public sector unions have garnered especial criticism for their pensions, which Republicans claim are bankrupting the state. Such lack of concern for elderly well-being is sadly consistent with Republicans' efforts to cut funding for programs providing the elderly with support for meals and housing. Incidentally, women make up two-thirds of the poor over age 65, while 60 percent of black seniors rely on Social Security for more than 80 percent of their income. So women and people of color aren't just paying for the cuts once, they're paying over and over again. Of course, public sector cuts hurt people across the board, but they nearly always end up hitting the most vulnerable members of society the hardest. As Paul Krugman pointed out earlier this week, unions are important in part because they're some of "the few influential players in our political system representing the interests of middle- and working-class Americans." Indeed. But public sector unions are especially important representatives of middle- and working-class black and female Americans, who continue to be vastly underrepresented in every branch of government. Republicans will surely protest that their efforts to undermine the public sector, whether by busting unions or slashing services, aren't sexist or racist -- they're just what needs to be done to balance the budget. And honestly, I suspect the gender and racial impacts of union-busting never consciously crossed Gov. Walker's mind. But not knowing exactly whom your policy decisions will hurt means you've never thought about the actual people who are affected by political maneuvering. If Republicans don't know who's paying for their attacks on public sector employees, it's because they just don't care. I’m coming in on this 7 years late, but I agree with this article, except the statement that “I suspect the gender and racial impacts of union-busting never consciously crossed Gov. Walker’s mind.” I disagree. I’m sure that was the FIRST thing on his mind, knowing that pitting private sector (white male) unions against public sector unions (after exempting police & firefighters, largely women) is a perfect way to divide & conquer. Seven years later, this is still the elephant in the room that no one is discussing, even though the Repubs continue to go after teachers’ unions. It’s easy to convince people that women do not deserve living wages & benefits.